The ColorLab is on hiatus this week. Our Head Chemist, Julie, lost her Grandmother this week. The team agreed to take the week off to give Julie time to deal with all that she needs to. Our thoughts and prayers are with her and her family. Here is a card I made tonight for Julie and will be mailing tomorrow. In the spirit of Color, I used my Color Coach to choose the colors. It took several times flipping through before something "spoke" to me. I really only have this set, Thoughts & Prayers for Sympathy cards. And I always seem to default to this same layout. So, I looked at colors that would work with this set and finally settled on these: Soft Suede, Riding Hood Red & So Saffron. Just seemed perfect for the tree image. Maybe more of a Fall then Spring feel, but that's OK. I'm skipping the details and all the rest and just sending this card on to Julie. My thoughts and prayers are with her and her family at this difficult time. Contact me if you'd like to send a card to Julie and I will get you her address. Thank you all for understanding. We'll be back next week with our regularly schedule challenges. Beautifully done. 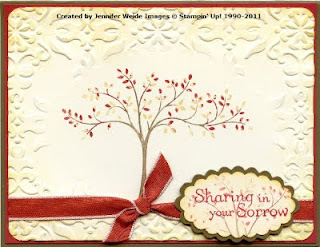 As you say, it has fall colors but that is perfect for a sympathy card. It will be so meaningful to Julie.